Welcome, welcome, welcome to our first birthday celebrations. Courtesy of Candy Colwell one of our ex Creative Guides. There’s lots to tell you today about the changes to our schedule and what surprises there are for the birthday winners (you will definitely want to see what they are - so read on please..), but first I want to extend a very warm welcome to our newest Creative Guide Shari Trumbull. Shari lives at Ain’t That ArtsyFartsy and you can find her photo and read more about her in 'Meet the Creative Guides' in the sidebar. 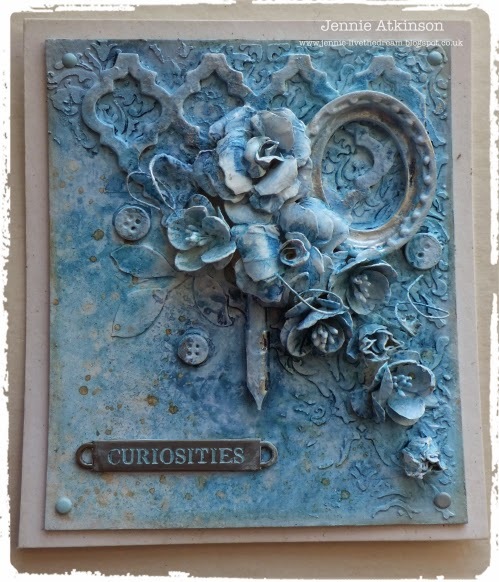 I am sure you will extend a warm welcome as she joins us today with her first Creative Guide challenge sample. You will also notice that Trace is on the line up and is going to stay with us and I am so pleased she has managed to find some time to join in today as well. In fact I think there is something from all of us to whet your appetite for this next challenge. So grab a coffee and a few minutes of your time to help get this party started. From today we are changing our challenge schedule quite significantly, we are now posting one challenge a month and the winner will be chosen by random.org. We continue to have Country View Crafts as our fabulous sponsor and Susan will be donating a £20 voucher as the prize. Our challenges will go live at midnight on the first Friday of every month and finish at 6.00 pm on the Thursday night - the day before the next challenge commences (London time). 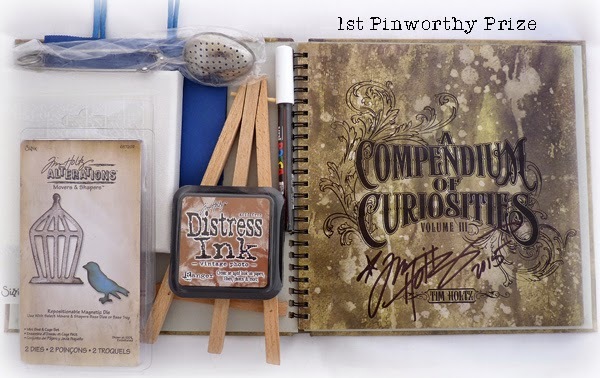 We are continuing with our 'Pinworthy Mentions' and these will be the Creative Guides' Top 3 from all the entries, as last year it will be the Host of that month's challenge who will pull all the Creative Guide suggestions together and make the final decisions. Those projects will be pinned to the appropriate Pinterest board on our Pinterest site and we will send you a Pinworthy badge for your blog. 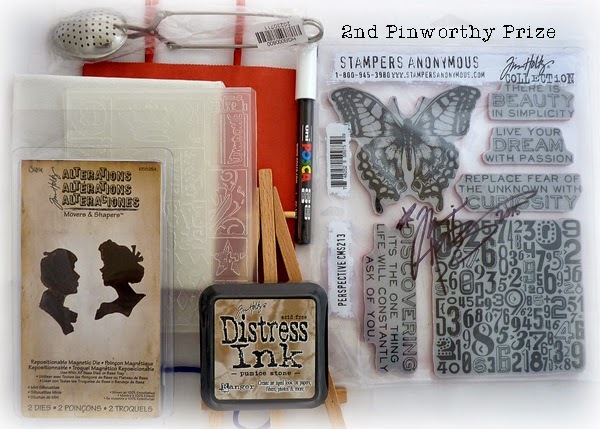 Throughout the month Fridays will be project based with guests and we will invite the winner and the pinworthy mentions to join us with a project as guest Creative Guides. We will also continue with a special invited guest each month - so watch out for a very special Tim team member, Paula Cheney who will be with us on the 27th March. 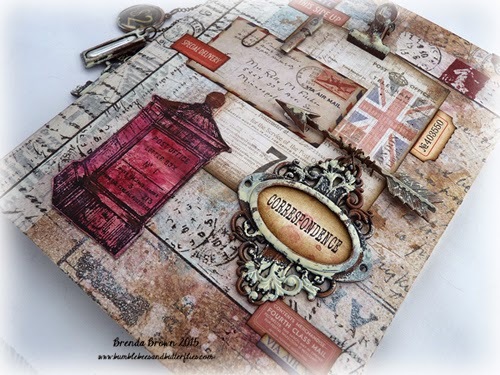 Mondays will be education days, every Monday there will be a Destination Inspiration post brought to you by one of the Creative Guides and if you pop back here next Monday Alison is first up and she will explain what we will be doing. To celebrate our first birthday we are going back to the first challenge we started off with in March 2014. 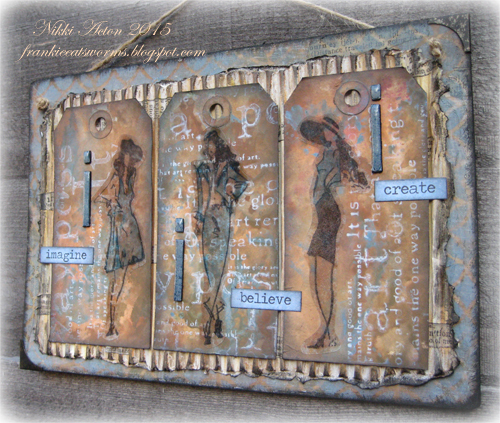 Make 'Anything Tim' your key focus with one of those vintage, shabby, mixed media or journaling projects that has a Tim Holtz influence. What is a Tim influence? Well it could be that you use one of his techniques, some of his stamps, Idea-ology range, dies or his embossing folders. Alternatively, you might take one of his tags for inspiration or use something from one of his books or videos. Whatever it is, just have fun and post it on here with the proper links (see our Travelling Instructions in the side bar). Whilst I love all the wonderful "Tim" techniques, more than anything I love using Tim's products in my own style. 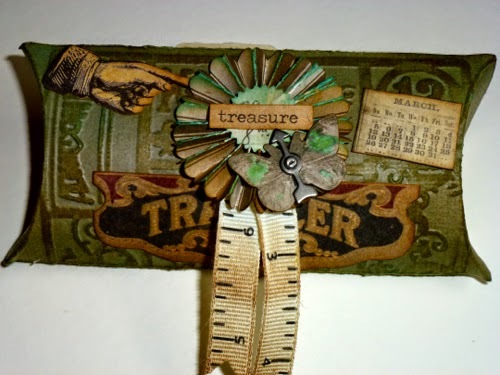 And this is my favourite - pulling together a disparate collection of items (die cuts, flowers, metal, buttons, etc), equalising them all with gesso and then re-colouring them using Distress sprays, inks and paints. If you want to see what I used and the process then do please hop on over to Live The Dream where there are more details. To celebrate our first birthday I have created a tag to commemorate this, using lots of new and some older Tim goodies. If you would like to see more, please pop over to my blog. It is so hard to believe how quickly a year goes by and Happy Anniversary to AVJ! 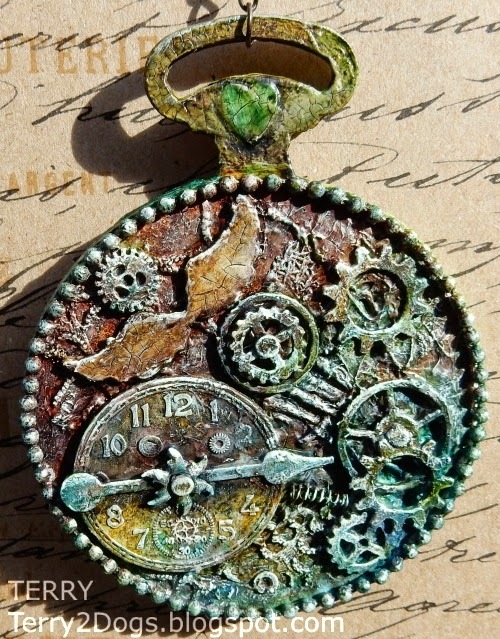 Well AVJ is not the only one with an anniversary and my pocket watch die full of Tim goodies will be gifted to my absolutely better half for our special day. Stop on over for all the details right HERE. I just couldn't resist baking....Oops ! making a cake for our 1st Birthday Celebrations. After all a party just wouldn't be a party without a Birthday cake. 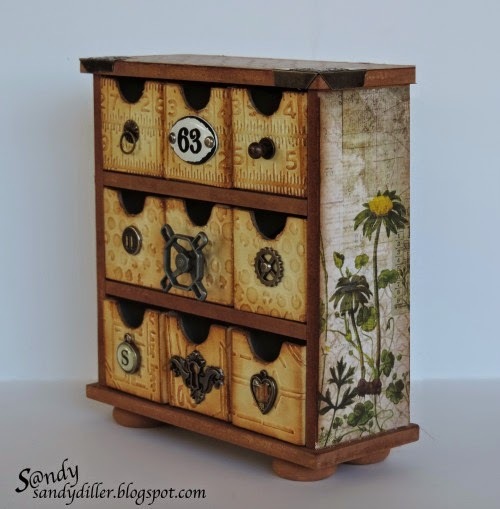 I would love to have you pop over to Juliz Design Post to see all the details. 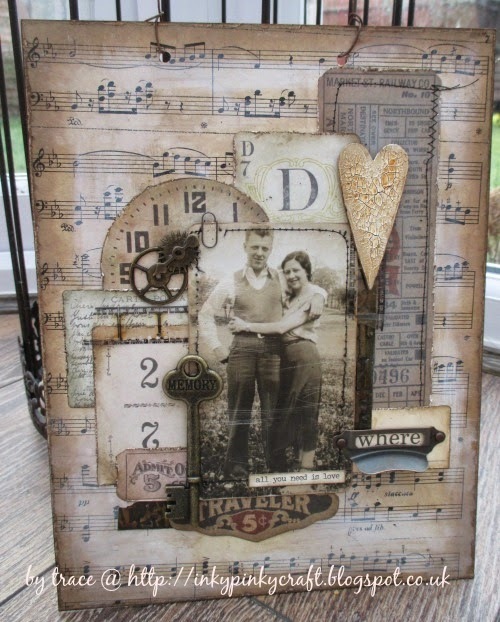 For our 'Anything Tim' challenge I decided to use the new Runway stamp set and create a wall hanging for my study. 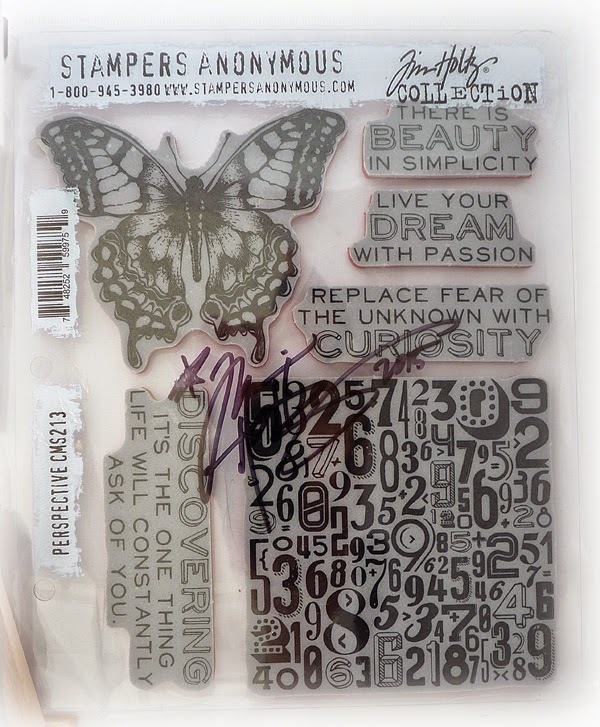 Lots of Tim inspired techniques including stamping on frosted film coated acetate. More details over at Addicted to Art today. 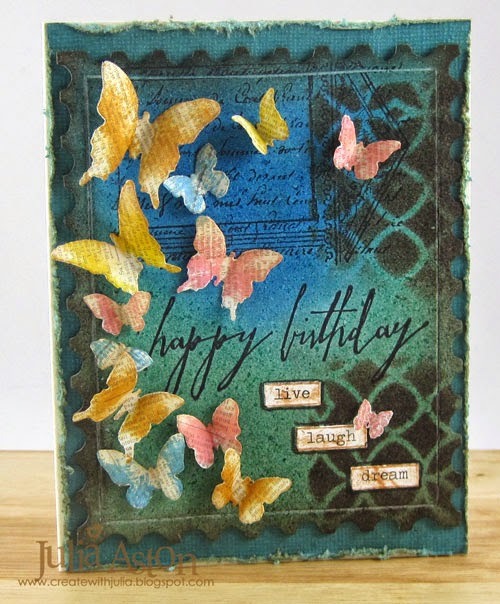 I used some new Tim (Cracked Pistacio Distress Ink, Handwritten Sentiments) and several old Tim (Butterfly Frenzie and Postage Stamp Frame dies, Latticework Stencil,Chit Chat Stickers to name a few) for my Birthday card celebrating A Vintage Journey's first birthday! You can find out just how I put this together over at my blog post here. I'm celebrating by playing in a different style than normal... I was trying to stay true to the spirit of the sentiment! 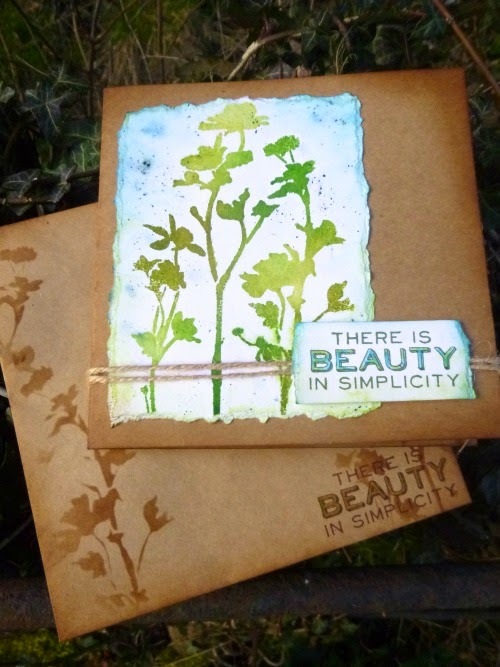 And I had a lovely time playing with this glorious new stencil from the latest CHA releases to create this card and co-ordinating envelope. Come over to Words and Pictures if you'd like to see more. 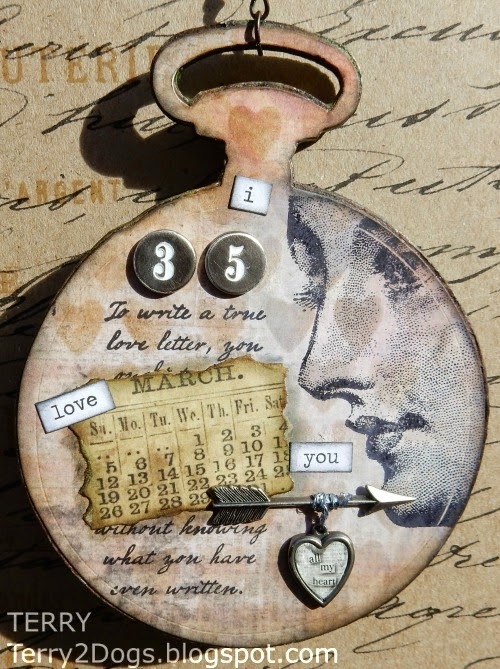 I am loving collage style pieces and have used lots of my favourite Tim Holtz goodies, with lots of distress inks and stains as well as plenty of my favourite... idea-ology and lots of ephemera. Curiously, my 'hedgerow album' has been made using Sheena Douglas dies, BUT the inspiration for the album is Tim's riveted patchwork technique made with foil, alcohol inks and distress paint. I use a lot of non-Tim products in my crafting but most of what I make is inspired by Tim's techniques in one form or another. You can find the step x step for my album on my blog. I've been in the process of reorganizing my blog and studio so thought I would share a storage chest I made to hold some of my Tim stash. This little chest has made it easy for me to find those small items that I sometimes forget about or don't want to look for. I have these items at my fingertips with this storage unit sitting on my worktable. 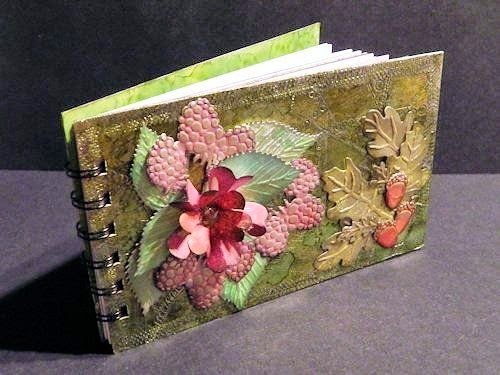 For more details and tutorial please stop by my blog here. It's so hard to believe that we are celebrating our 1st Anniversary here at AVJ and with so many gorgeous giveaways as well as a great challenge. I'm celebrating Tim's new Correspondence papers today and I've made a hard back bound book which I think I might just use as a birthday book. £20.00 gift voucher for the Country View Crafts on-line shop. donated by Tim and Mario. THANK YOU TIM AND MARIO for sharing our birthday celebrations with us and sending these fabulous items for three of our lovely challenge entrants to win. 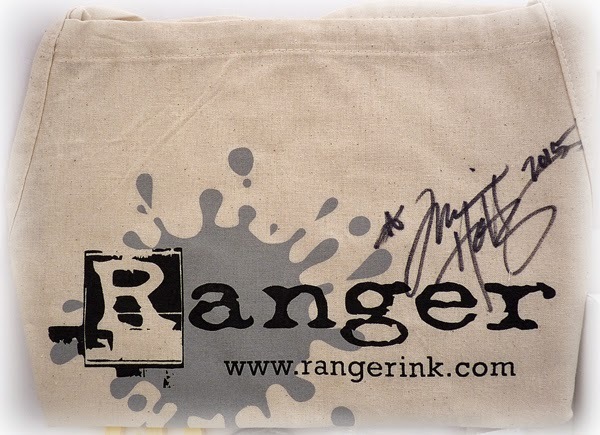 (The additional products have been donated by Brenda and Chris). I would like to say a big thank you to everyone who is supporting and donating, including Susan, Anne and Chris and of course Tim and Mario and to all of you who enter our challenges, what an extra special birthday it is and now we are looking forward to year two of AVJ themes, guests and destination inspiration posts. A Happy Birthday or Happy Anniversary if you are celebrating something special today and that includes our fabulous CG Terry who has a wedding anniversary today. I love this celebration and all the wonderful inspiring DT artwork. What a wonderful year it has been and the journey even better! Hugs to all! WOW!!! First of all Happy First Birthday and second of all THANK YOU for putting together such amazing prizes!!! Great inspiration from DT!!! I need to whip up something really good for this occasion!!! Happy Birthday AVJ. Celebrations on here and the Prizes are yummy! Mind blowing inspirations by the DT. This is really exciting and I can feel the celebration vibe here. Happy birthday AVJ! What wonderful inspirations from the design team and what fabulour gifts for your birthday celebration. So glad I found you and your wonderful blog, I've learned so much in the short time that I've been following along. Can't wait to see what this new year brings! Absolutely gorgeous creations by the team! Happy Birthday! What a fun birthday party with such wonderful presents!! I am in awe of the variety and creativeness of all the Creative guides projects - well done ladies! A Very Happy Birthday AVJ. It is a great journey so far with you talented ladies. You are vary generous to share your knowledge. The techniques, tips and tricks were just awesome. 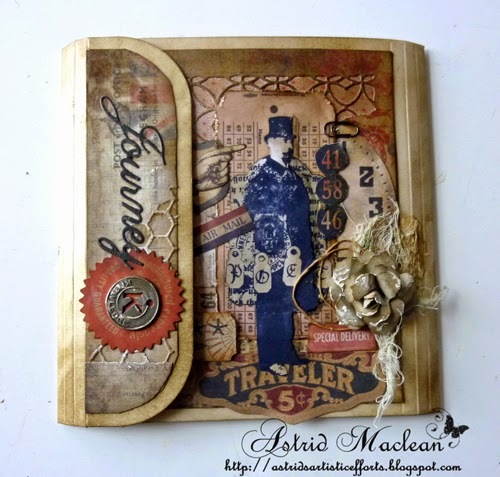 I am not regular participant in challenges here, but love to visit DT's posts as well as other beautiful entries. Thanks so much for creating something...which is only 'Tim' ....he is huge inspiration for all of us. 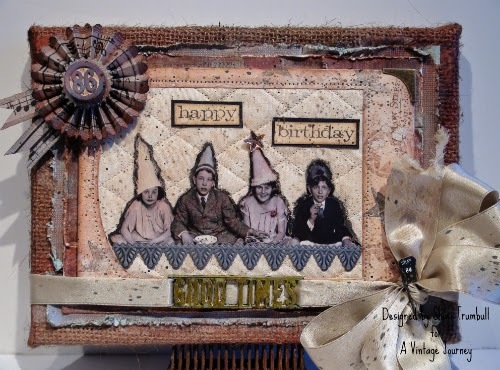 OMG...I am blown away by the creativity on this blog today, Happy Birthday by the way, and good luck for another successful Year. I think going monthly is good, it gives one more time to construct something that has had some thought put into it. You are giving away wonderful prizes which is also a great incentive; it is always a pleasure to visit this blog, you have a wonderful team. Congratulations on your 1st birthday!! That means a whole year has gone by and I've not managed to join in with a single challenge.. oh dear! I have faithfully read every one, and still never managed to find/make time to join in... maybe now I have a whole month to do so, things will be different... You have some fabulous prizes on offer, but I already have Compendium 2, so please exclude me from the generous random draw for it with this comment. Happy Birthday, AVJ!!! I remember one year ago when I was waiting for the launch of this fabulous journey, having seen the announcement some days before... And anything Tim was the first challenge I entered in my blogland life !I had the luck to win a challenge later, so AVJ means a lot to me! I ´m going to join, for sure! Thanks a lot for your inspiration, ladies! Amazing inspiration from everyone on the team, this has been such an exciting year and I so look forward to the year ahead!! A big thank you to everyone, all of our players, for taking the time to be part of this journey time after time, to my team mates for all of their inspiration, to Brenda and Chris who do endless work behind the scenes, and last but not least to Tim and Mario, not only for their gifts, but for the endless inspiration. Without them this journey would never have begun. Happy Birthday AVJ!!! Happy birthday. Thank you for your creative and inspirationnal blog. Your team is faboulous ! Happy Birthday to everyone x a whole year!!!!! Where has it gone ? Wonderful celebratory projects by my Creative Guide sisters. I am so honoured to be here amongst you as a Creative Guide. Welcome to The very talented Shari Trumbull and its great to see Trace here too. The blog looks amazing, hard to believe a year has gone by already. Looking forward to the next year. Good luck to everyone entering the anything Tim challenge to win these fab prizes. Amazing projects again this week can't wait to visit you all and get the how too!!! Happy Birthday! Wow some fabulous projects! Love visiting the blog to see everyone's always inspirational art! HAPPY BIRTHDAY AVJ!!!!! I have soooo enjoyed the last year of all your creative hard work. It's a great inspirational blog to stop by and enjoy while sipping my morning coffee...like right now. I love being a Guest Guide too! I look forward to the new changes giving me a whole month to join the fun. Sometimes even 2 weeks is hard to make the deadline. Sending you all Creative Hugs! Happy Birthday AVJ!!! I have had so much inspiration from all the DT members during the past year! This blog is awesome! For this beautiful occassion all the DT members did a great job! The creations are fabulous! Thank you so much to you all! Happy Birthday! So many amazing projects for inspiration! Fantastic prize packages, too! HAPPY HAPPY HAPPY 1st year birthday/anniversary. I have learned so so so so much from all of you. NOT ENOUGH yet so keep it coming... Hungry for all you do in year TWO!!! All the DT projects were just wonderful... I'm awed. And thank you so much for all the prizes - wow. I would be so thrilled to have my number picked!!! Also hope I can create something worthy of your teachings!! j. 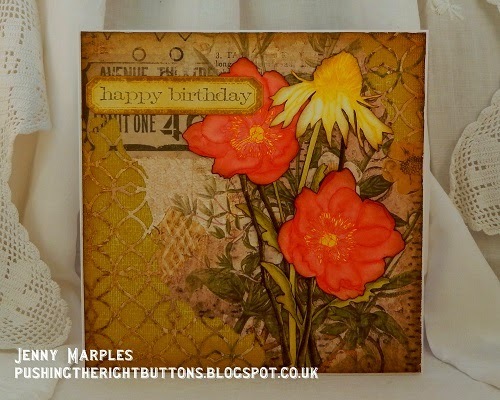 Happy 1st birthday dear creative guides from Vintage Journey, I love your inspirational projects, and your challenges! Can't wait to continue with all of you in 2015! Happy 1st birthday AJV!!! Looking forward to years more of Tim inspiration from the team!! Goodness, the talent just blows me away. Such talent and diversity is shown in their work. Congratulations and Happy Anniversary to you all. It takes a lot of effort and dedication to run a challenge blog. Happy first birthday/anniversary to those who organize and inspire with amazing creations month after month, challenge after challenge. 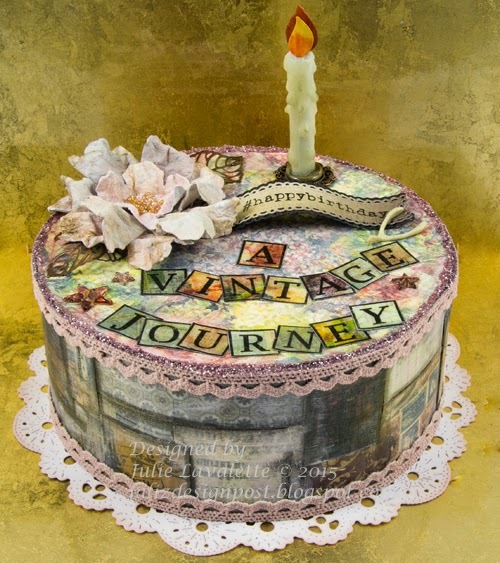 Happy Birthday, A Vintage Journey! It has been a pleasure to participate in the challenges since this past summer. Each one of you has been so supportive and inspirational to me. Special thanks to Chris who has put up with my nonsense much more than she should have to, and to Brenda, who has been helpful, too, with my blog. A warm welcome to Shari--what a perfect girl for the team! 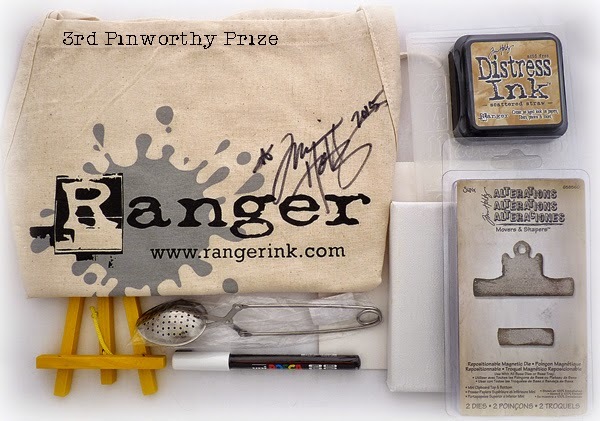 Thank you for this opportunity to win some goodies--these prizes are very generous! Thank you for all you do! PS Great projects, ladies! I will be visiting over the course of the month. Happy Birthday A Vintage Journey! A heartfelt Thank You to all contributors ....we so appreciate each of you!! Happy Birthday AVJ! I have had such inspiration from your guides and lots of fun creating for the challenges. Thanks for all your support with blogging and when I got things wrong sorting me out! I am happy that the challenges are monthly now, I have a few unfinished pieces I didn't submit because I ran out of time. Happy Birthday! Your blog is so full of inspiration! Some day I will actually have time to follow these great ideas. Thanks to all who share their talents with us. I just love this blog and this is the second time I have entered in a row, so glad i have found somewhere that focuses on Tim and Mario, adore all the teams work and will be off to have a closer look at them all. Wow! I can't believe it has been a year already! You continue to amaze with the incredibly talented designers and their beautiful, inspirational projects! Thanks for all you do! Happy birthday to AVJ and a special co grays to ALL of the Creative Crew for a year's worth of EXCELLENT projects and shared creativity. This truly is such a talented team. 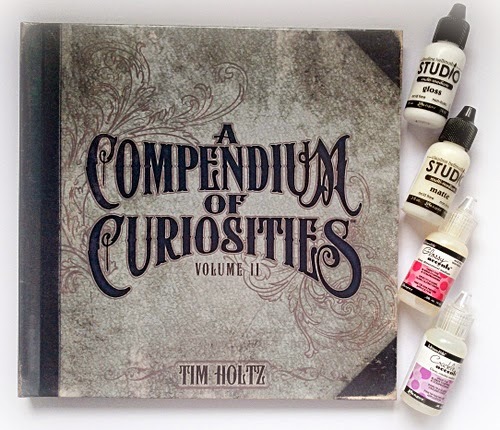 You make Tim's products really shine through all of your individual styles and artistry. Love all the inspiration this blog offers. I look forward to linking up each month. Congratiolations and my best wishes for the next year! Thank you very much for this beautiful inspirations!! Great blog with wonderful inspirations! Happy 1st Birthday! Wow ..... fabulous projects by every designer ! I am the newest follower and so glad abt that ...!! Happy Birthday to you!!! I am so glad I was able to stop by today. I have been hoarding/collecting Tim goodies forever. This challenge and the fabulous prizes have inspired me to play along.Thank you! Happy birthday AVJ and your team. Lots of great inspiration to challenge us and oh so special are the prizes. I can't believe I have only just come across your fabulous challenge blog. The designs from your team are so creative! Lovely inspiration! Happy Birthday A Vintage Journey! A great challenge blog and a terrifically talented design team. Thank you for all the inspiration. Dear AVJ team, happy birthday! Thank you for the year full of fabulous inspiration...you really are a bunch of most talented ladies...love your work...keep inspire us! Happy Birthday, AVJ! What amazing inspiration and also details to inspire our creativity. I think having a month will give many of us a better chance to follow this inspiration. Thank you also for deciding to have random winners - I am sure that selecting a winner has been a very difficult task! Happy Birthday and Congratulations! There are some lovely creative pieces here! Gorgeous inspiration! Happy Birthday and Congrats to you all for a year well done! What a wonderful group of creative people! Thanks for sharing your ideas, talents and enthusiasm! Looking forward to another year of inspiration!